There will also be regulation of sports sponsorship for the first time if new legislation agreed by the Government passes. THE DEPARTMENT OF Health has announced proposals for changes to the law aimed at tackling alcohol abuse in Ireland which include restrictions on low prices and on advertising as well as the introduction of warning labels and calorie details. For the first time, there will be legal regulation of sports sponsorship, as well as the introduction of a broadcast watershed for television and radio advertising. Cabinet signed off on the proposed measures on Tuesday, which will form the basis of the Public Health (Alcohol) Bill 2015. Included is something groups concerned about alcohol abuse have been shouting about for years – minimum unit pricing. The new legislation will include provisions to prevent the sale of very cheap alcohol, making it illegal to sell or advertise alcohol at a price below the limit. This is mainly aimed at those who drink in a “harmful or hazardous” manner and will most likely affect supermarkets with bargain deals and bars and clubs offering extremely low prices to students at promotional nights. 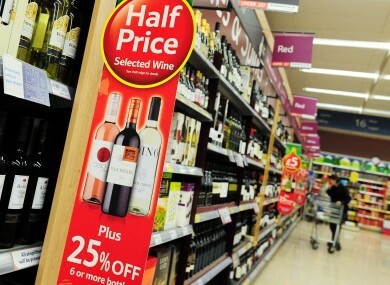 What that minimum pricing limit will be has yet to be determined. “It will obviously need to be sufficiently high to eliminate very cheap alcohol which really drives binge drinking, but not so high that it affects most consumers,” Health Minister Leo Varadkar said. The Department said yesterday that the minimum price will be set at a level which evidence shows will reduce the burden of harm from alcohol. The Bill does not propose to ban alcohol companies sponsoring sporting events, an idea that met with significant resistance from sports bodies. It was reported last month that the government had dropped the proposal following lengthy discussions and concerns expressed about what would replace the funding from alcohol companies. Varadkar insisted that the current bill includes the regulation of sports sponsorship and all other marketing and advertising by alcohol companies with “legally enforceable codes”. He said this was “a major step forward” and said the legislation would be reviewed in three years’ time. The Fine Gael TD insisted the government had “not abandoned the principle” of a sports sponsorship ban and was instead “going ahead with 80 per cent of measures that everybody agrees on”. A government spokesperson said last night that the report of the inter-departmental working group examining the sports sponsorship issue would be published shortly. Though the department described these measures as “far reaching” Varadkar acknowledged the legislation won’t satisfy everyone. “Industry will complain about the impact on them. Health campaigners will be disappointed that a complete ban on alcohol sponsorship has not been introduced,” he said in a statement. But I am not prepared to postpone this legislation and continue to have endless discussions and delays. Instead, I am moving ahead with all key elements of the package including the regulation of marketing, advertising and sponsorship. There will be new enforcement powers for Environmental Health Officers which will allow them to police this minimum unit pricing, among other things. Health labels on alcohol products are expected to be introduced through this new lesiglation, which will require producers to provide warnings and advice, the amount of pure alcohol in grams and the calorie count on containers. Pubs, clubs and restaurants will also be obliged to give this information to customers who buy alcohol on draught or in measures. “This legislation is the most far-reaching proposed by any Irish Government. For the first time alcohol is being addressed as a public health measure which makes this a legislative milestone” Minister Leo Varadkar said. Public Health (Alcohol) Bill 2015 contains measures 2tackle widespread problem of alcohol misuse.3people die every day due 2alcohol abuse. The proposals were welcomed by the Alcohol Federation of Ireland, which represents manufacturers and suppliers. Director Ross Mc Mathúna said his organisation hopes this can mark the “beginning of a new era of engagement” between all parties involved in this, to develop lasting solutions to alcohol abuse. Alcohol Action Ireland was also positive about the news, which it said signals the Government’s intent to regulate alcohol as a public health issue for the first time. However the charity’s CEO Suzanne Costello said the decision to place the existing voluntary code of practice for sponsorship on a legislative footing is a “significant weakness”. Email “Those supermarket booze deals could be in danger...”. Feedback on “Those supermarket booze deals could be in danger...”.